Australia faces a future without domestic auto production after Toyota says it will leave. Economists have warned of a new recession in Australia after Toyota Motor joined its U.S. rivals in announcing it would quit domestic car manufacturing by 2017. With potentially 100,000 jobs at risk in the nation’s southern states, can the “Lucky Country” survive the industry’s departure? On Monday, Toyota Australia confirmed rumors by announcing its “heartbreaking” decision to cease local manufacturing by the end of 2017 to become a national sales and distribution company, axing 2,500 directly employed workers in the process. The writing had been on the wall for Australia’s long sheltered auto industry after similar announcements last year by Ford and General Motors Holden, with Ford to cease production by October 2016 and Holden in 2017. Mitsubishi closed its assembly plant in 2008 while Nissan departed in 1992, leaving Toyota as the last man standing. The Australian Council of Trade Unions warned Toyota’s decision could cost the economy A$21 billion ($18.9 billion) and 50,000 jobs, due to the impact on associated supply industries. The University of Adelaide’s John Spoehr agreed, claiming the pullout by Ford, Holden and Toyota could push the southern states of South Australia and Victoria into recession. ‘‘This is the collapse of an entire industry, not just Ford, Toyota and General Motors Holden,’’ Spoehr said. ‘‘Those companies are the tip of the automotive industry – underneath them is a massive components industry and thousands of other suppliers…With Holden alone we were looking at 50,000 jobs . . . [now] you are looking at hundreds of thousands,” he told the Melbourne Age. Shadow Industry Minister Kim Carr echoed the comments, warning of the nation’s worst crisis since the Great Depression and blaming the Abbott government for failing to offer more support. “Toyota is very diplomatic, but there is just no doubt what Toyota told the Productivity Commission as recently as December, and I quote directly from their submission: they were looking for a long-term, consistent, globally competitive policy suitable for the Australian context to attract future investment,” he told Sky News. Despite the industry’s pending end, other analysts pointed to the cost of government assistance and the potential for new job creation elsewhere. According to a recent Productivity Commission paper, automotive manufacturing “remains one of the most heavily assisted industries in Australia” with the equivalent of A$30 billion in government assistance provided between 1997 and 2012 in the form of tariffs and other subsidies. 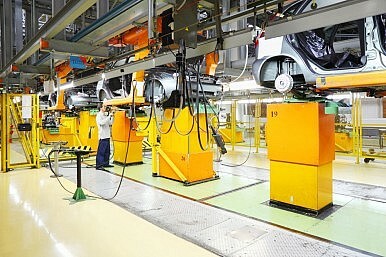 The Australian Financial Review’s economics editor, Alan Mitchell, said the closure of automotive manufacturing would be a “plus” for the economy in the long run. The business newspaper’s Greg Earl cited recent Australian investments by Japanese companies including Dai-ichi Life, Kirin, Sekisui House and Uniqlo as evidence that Toyota’s departure would not mean the end of Japan’s corporate interests Down Under. Australia’s manufacturing sector has shrunk to 7 percent of gross domestic product, down from the 25 percent levels seen in the 1960s and below the double-digit rates of even Britain and the United States. However, the nation’s comparative advantage in agriculture, mining and tourism and the expanding services sector are seen as more promising sources of future growth. New Zealand offers a possible guide for Australia given the closure of its automotive manufacturing industry in the 1990s on the back of reduced tariff protection. From producing 63,000 cars a year in 1988, the nation’s industry has shrunk to a handful of boutique firms with the bulk of its vehicles now imported from Asia. New Zealand’s second-hand cars are considerably cheaper than those across the Tasman, largely due to Australia’s prohibitive A$12,000 tariff on used-car imports. Australians are already voting with their wallets, with the share of locally made new vehicle sales falling to a record low 10.4 percent in 2013, despite all-time high vehicle sales of 1.1 million. Toyota aims to sell a record 10 million vehicles globally in 2014, of which domestic sales are expected to comprise 2.3 million units. After starting production in Australia in 1963, the Japanese giant’s exit marks the end of an Australian industry founded on government support that is no longer considered viable.